Soundtrack album by James Murphy, et al. 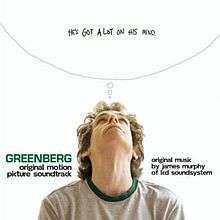 Greenberg: Original Motion Picture Soundtrack is the soundtrack to Noah Baumbach's film Greenberg. It includes LCD Soundsystem musician and DFA Records co-founder James Murphy's debut film score, as well as songs by other artists. Albert Hammond: "It Never Rains in Southern California"
James Murphy: "Plenty of Time"
LCD Soundsystem: "Oh You (Christmas Blues)"
James Murphy: "If You Need a Friend"
James Murphy : "Please Don't Follow Me"
↑ "James Murphy's Greenberg Soundtrack Details". Pitchfork Media. Retrieved February 5, 2010. 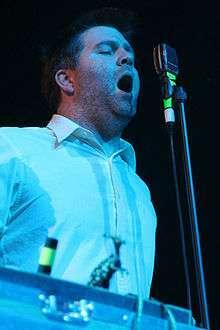 ↑ "LCD Soundsystem: 10 Questions for 2010". Drowned in Sound. Retrieved February 11, 2010. This article is issued from Wikipedia - version of the 7/14/2010. The text is available under the Creative Commons Attribution/Share Alike but additional terms may apply for the media files.